I am always looking for fresh ways to mix colors and create new color palettes to use in my work. One of the best ways I have found to get new color mixes is by taking photos of things that jump out at me when I am out and about. 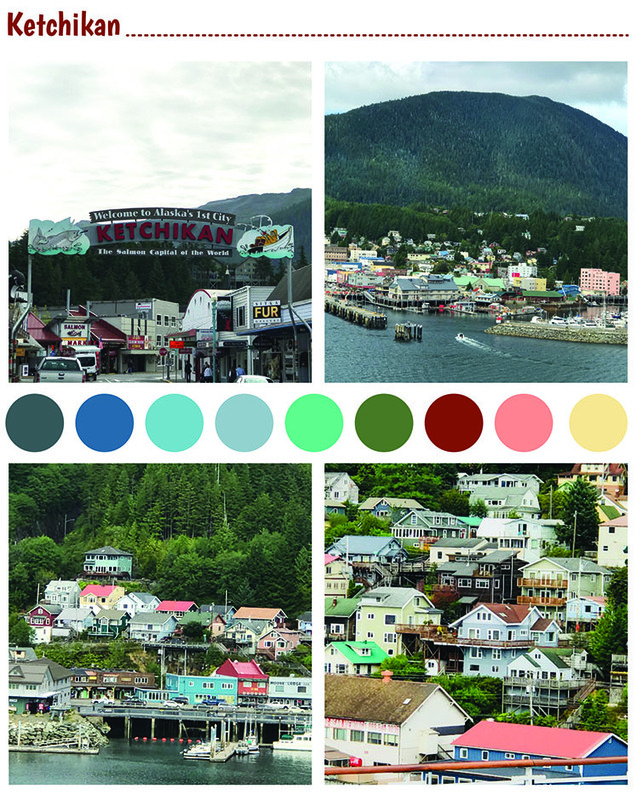 I created two new color palettes inspired by my recent travel to Alaska. My first palette is inspired by my visit to Glacier Bay National Park. The deep blues of the icy water, the blues and grays of the glacier ice and the greens and browns of the landscape create a beautiful color mix. Who knew there were so many shades of blue in ice! My favorite stop in Alaska was the city of Ketchikan. It’s beauty speaks for itself but what I really loved are the colorful buildings and houses scattered among the evergreen trees. Perfect color inspiration! Inspiration was everywhere I looked as I traveled through different Alaska towns. From the downtown sculptures and park benches to my visit to the totem poles and Clan House at Totem Bight State Historical Park, the art of the Alaskan Native people is all around you. The art is bold with beautiful colors and the distinct shapes create a graphic quality that I love. There are stories and events associated with much of the Native art, particularly the totem poles, and it is difficult to avoid an emotional connection and sense of reverence when standing in a beautiful, wooded landscape viewing them. But wait… first things first! We need a family cruise graphic to go on our matching cruise sweatshirts! Travel is good for the soul. Through travel we learn things about new places, people, cultures and ourselves. This past August I had a great adventure that took me to the Land of the Midnight Sun: Alaska. My adventure began with my parents’ 50th wedding anniversary. In celebration, it was their wish that the whole family set a course for adventure on board the Princess Ruby cruise ship - destination Alaska! I have never considered myself a cruiser and would never have chosen a cruise as option number one when making travel plans. Visions of being stuck on a boat for long stretches of time, sea sickness, or worse Norovirus, danced in my head (remember the poop cruises that were in the news a few years ago?) . My worst fears never came to fruition, however, and cruising turned out to be much more enjoyable than I could have imagined. It is really a great way to see Alaska for the first time and there is no better way to see Glacier Bay, which was was a moving experience in itself. Alaska is spectacular! The scenery is breathtaking and it is full of beautiful art, culture, people and food. It was a truly memorable and super fun adventure! I found inspiration everywhere and I will share more of what inspired me in a future post! Spring break took me to sunny Southern California! Not only was I in need of some R & R, but a good dose of inspiration was a must. Disneyland was just the ticket! Having lived in Los Angeles at the start of my career, I had visited Disneyland many times but I had never really looked at it through my artist eyes. Sure, I had always appreciated the magic, but this time I studied. One attraction in particular spoke to my artist soul. It's a Small World. I learned a little bit more about it too. It was originally created in 1964 by Walt Disney to debut at the New York World's Fair as a salute to the children of the world. Walt had brought in the amazing artist Mary Blair to help with the design. If you are an artist, you are most likely familiar with Mary Blair. Her style was perfect for this special project. In 1966 It's A Small World found a permanent home at Disneyland in Anaheim, California. In Disneyland you wait in line. A lot. But there is more than sunshine to soak up standing beneath the gorgeous facade of It's A Small World. From the sparkling white structure with its spinning and twirling gold details to the animal topiaries, what's not to enjoy? And that clock parade... oh that clock parade! When the clock chimes the doors pop open and out parade the most adorable characters singing that unforgettable song. And then it's your turn and in the boat you go to take the "happiest cruise that ever sailed 'round the world"! The graphic and stylized scenes, adorable characters and gorgeous light and colors transported me around the globe and brought me back home with oodles of inspiration.